Are you doing the selling for your firm? Would you like to delegate the sales to a salesperson and have your salesperson produce the same volume you do or better? Perhaps you’ve thought of bringing on a salesperson but you’ve been unable to do so because nobody’s been able to sell the jobs as well as you can. Are you doing the selling for your firm? Would you like to delegate the sales to a salesperson and have your salesperson produce the same volume you do or better? Perhaps you’ve thought of bringing on a salesperson but you’ve been unable to do so because nobody’s been able to sell the jobs as well as you can. 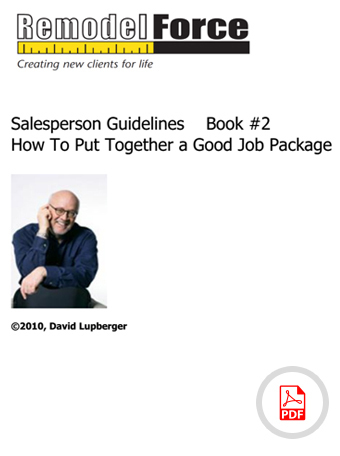 With these salesperson guidelines, you can have your salespeople sell your services as well or better than you do, which in turn will add additional profit to your bottom line. These guidelines cover everything from the first sales appointment to putting together a really good job package for your production team. These two manuals eliminate the confusion, miscommunication, and errors that go into selling profitable projects and getting them ready for production. A growing remodeling company will find this to be an invaluable resource. Buy Book 1 or Book 2 separately if desired.